Perfect for free-motion quilting machines or home decor machines that have a large sewing area. Convenient handles help keep your hands safe from the needle. Available in 8" and 11" quilting rings. 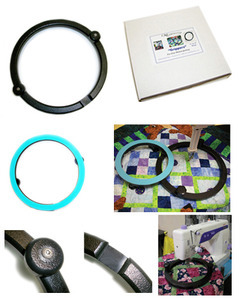 Use these free motion quilting hoops on most home sewing machines for a variety of quilting projects. Made out of high-density polyethylene these hoops are both tough and durable. The set includes one 8in and one 11in quilting gripper. Conveniently located on the bottom of each are non-slip grippers which prevent the hoops from sliding on the surface of the fabric. Each one also has a hand grip for easy control that will help keep your hands safely away from the sewing head. Free-motion machine quilting just got easier! Two knobs on each no-slip Gripper Hoop give you a secure, safe, and comfortable grasp on your quilt. Knobs may be tightened to move as one with the hoop, or loosened to swivel. Works with table or home machines. 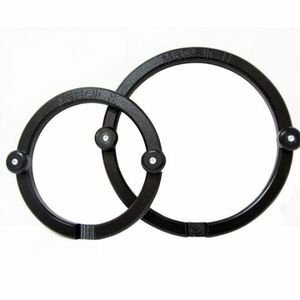 Our smaller sized free-motion quilting hoop with an inside diameter of 8" is the perfect size for freemotion quilting on home dec machines with an average sewing area. Our exclusive rubber backing grips your quilt top enabling you to easily maneuver your quilt "sandwich" as you sew. Convenient handles not only keep your hands a safe distance from the needle, but also allow for a comfortable grip of the hoop. Also available in a larger 11" size or as a pair. You will truly love these hoops!! 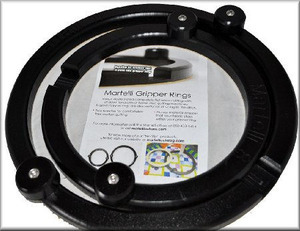 Martelli Free Motion Quilting Gripper Rings (Hoops). Always Fast Shipping and I found the lowest prices here at AllBrands.com. This order was part of a Christmas gift. The product was as presented. Delivery was excellent. I am well pleased. Thank you! the product arrive fast and was exactly as described . i used the product already and it worked like it said. very pleased. i did not get an email confirmation that it was shipped and when i would be expecting it, so when it arrived only a couple days later, i was surprised. because of package theft in the area, i would have liked an email. however, i was home, so no issues.